TB 165cc Big Bore Kit, Race Head V2, and Intake Manifold Kit – This is the next step up in power after the 143cc kits. Of course, the upside is the extra power but the one downside is this particular kit requires engine dis-assembly and case boring for installation of the bigger cylinder. However, its a great kit to upgrade to while your engine is apart, say for installation of a stroker crank or for some other mod. Or, upgrade simply for the quest for more power! 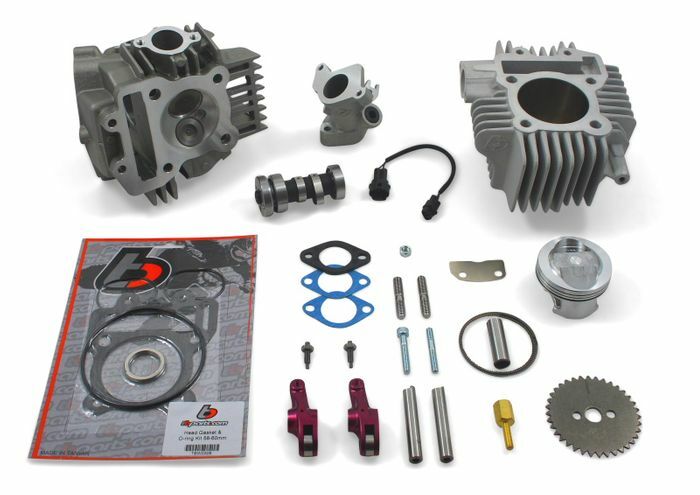 64mm Ceramic coated all aluminum cylinder (no steel sleeve) Lightweight high compression domed 64mm piston with rings, pin, & clips (will safely run on pump gas, 90-93 octane) Head gasket kit – Now includes the cylinder head o-ring set and an exhaust gasket. The all aluminum ceramic coated cylinder is not only lighter than a steel sleeved aluminum cylinder, it is harder, reduces friction (increasing power), improves sealing, and provides better heat transfer (runs cooler and cools down quicker). This kit requires case boring for installation.